Born in 1874 in London, Gilbert Keith Chesterton was a writer, critic, lay preacher and poet who was known for his sharp wit and more popularly remembered for his fictional detective creation Father Brown. Over his lifetime, G. K. Chesterton wrote some 80 novels and prose works, 200 short stories and thousands of essays on everything from religion and philosophy to politics. Chesterton was initially educated at St Paul’s School in the heart of London and then went onto art school where he hoped to train to be an illustrator. He didn’t complete his studies, however, and began working for a publishers in 1896 which proved a turning point in his life. This was the time when he first started finding his feet as a journalist. Chesterton married early, in 1901 at the age of 27, a relationship that would last for the rest of his life. His journalistic career took off when he was given a column on the Daily News where he could express his opinions relatively freely. Even though he had failed to finish at art school, Chesterton was a keen and talented illustrator, and that may have helped develop his writing further. He was also a great debater and liked nothing more than entering into controversial arguments with some his well-known peers such as H.G. Wells and George Bernard Shaw. His famous fictional detective-priest, Father Brown, began appearing in short story form in various magazines from 1914 and quickly became popular with the reading public. Unlike the Sherlock Holmes stories of the time, the priest was more intuitive and tended to work on gut instinct and an understanding of human nature rather than any forensic analysis. Chesterton’s life was not free of controversy and he was, on several occasions, accused of anti-Semitism, particularly with his portrayal of Jews in his books A Short History of England and The New Jerusalem. But he was also a strong opponent of the policy of eugenics that had led the UK to implement the Mental Deficiency Act of 1913. A number of Chesterton’s poetic works came out of his calling as a lay theologian and apologist for the Christian faith. He considered himself an orthodox Christian and spent most of his life as an Anglican though he leaned in old age towards the Catholic faith. He wrote the hymn O God of Earth and Altar that was initially printed in The Commonwealth. Perhaps his best known poem though is The Ballad of the White Horse which was originally published in 1911. It follows the story of Alfred the Great at the Battle of Ethandun, is split into 8 books and contains over 2,600 lines, noted generally as one of the last great epic poems written in England. In later life, Chesterton converted to Catholicism and was invested as Knight Commander by the Pope and there have been calls, even in recent times, for him to beatified. 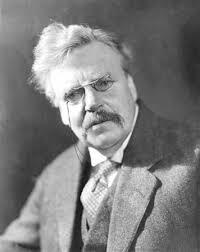 Chesterton died in 1936 from heart failure and was buried in the Catholic cemetery at Beaconsfield. He was 62 years old.